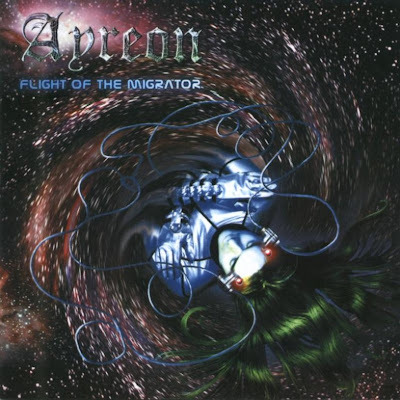 Universal Migrator Part 2: Flight of the Migrator is a progressive metal album released in 2000 by Dutch multi-instrumentalist Arjen Lucassen, and is the fifth album of his Ayreon project. The musical styles found on Flight of the Migrator are in stark contrast to its counterpart The Dream Sequencer, illustrating a wild, raucous journey through the tumultuous and chaotic reaches of outer space. In keeping with the setting of the story, the album's tone is much heavier, exuding a powerful, guitar-driven metal feel throughout. Both albums were released simultaneously, sold well and were received positively, with most fans purchasing both separate discs. In 2004, Arjen moved to a new record label - InsideOut Germany - and with this move came re-issues of all the previous Ayreon releases, including The Dream Sequencer. The special edition re-issue merged both albums into a single release, titled Universal Migrator: Parts I & II. No new features were added, as Arjen felt it would be unfair to those fans who bought both albums originally, in 2000.